Since the creation of the Qioptiq group in December 2005, this international group of companies has grown significantly in both size and capability. The Qioptiq group enjoys a worldwide base of operations, with the common focus of delivering optical and electro-optical technologies, products and services. The acquisition of the German Linos group of companies in 2007, adding to the incumbent elements of Pilkington (Qioptiq UK Ltd – QUK) and Avimo (Qioptiq Singapore – QSG) has created a solid foundation to deliver products and services to its customer base worldwide. Currently employing 2500 personnel across seven countries, with a 2008 turnover of $400m, the Qioptiq group has a lot to offer in the world of optical solutions. Weight and Power Reduction are common themes now seemingly carved in tablets of stone (Lightweight stone one would hope, or maybe a new super lightweight composite equivalent!) There are lots of possibilities that can be improved upon, however if you continue to analyse these areas you soon find yourself back to the 3 basics outlined above. The importance of being able to remain operational 24 hours a day, and not stop just because it gets dark is self evident. To be more aware of your immediate surroundings (where am I, where are my team / squad / section and to the best of our information – where is the enemy) and therefore local situational awareness (SA) is invaluable. The SA element is being satisfied through a mix of Surveillance & Target Acquisition (STA) equipment and C4I equipment (Radios, GPS, Digital Mapping, Soldier Computers etc etc), which also means that if you are unfortunate enough to get hit then the chance of surviving is greatly increased. With the STA equipment playing a significant role in the development of SMPs, the international Qioptiq group has a lot to offer through the design, development and support of Night Vision / Thermal Imaging weapon sights, surveillance sights and other dismounted soldier equipment. Some of the recent undertakings of Qioptiq UK Ltd and its experience over the past ten years with a number of SMPs, along with the development of the VIPIR2 thermal weapon sight family and SMMI (Soldier Man Machine Interface) products featured in the previous issue (Volume 2 – January 2009) are excellent examples of how the Qioptiq group has worked with Prime Customers and End Users to develop equipment. When taking a look at the wider SMP market it is easy to focus on the “Big Hitters” such as the USA (Land Warrior, Ground Warrior etc), the UK (FIST), France (FELIN), the Netherlands (D2S2, CIM, VOSS), Germany (IDZ) and Australia (Land 125), to name a few. In the main, these nations are moving forward from baselines of differing maturity when it comes to current equipment scaling and their dismounted forces already being experienced in the use of STA equipment. So they are either pushing to improve legacy equipment and systems or upgrade to the latest emerging technology formats, for reasons of reduced weight and power etc, or through gaining understanding of the capability and cost trade offs associated with this, whilst improving on integration. A number of the smaller nations are entering the SMP arena from a slightly different position, not yet having had the benefit of deploying wide scale night vision and thermal imaging equipment at the individual or team level. The task here is as equally about understanding the possibilities in order to confirm the requirement, before moving on to develop the system Architecture, as it is about having mature, off the shelf, combat proven STA equipment available to assist these projects. This remains vital to allow programme teams to carry out their own operational analysis and requirements capture, trade off studies and such like, in order to understand what equipment works for them as different technologies, each with their own strengths and weaknesses which can be trialled together. The ability to undertake these trials without the need to commit to costly and time consuming equipment development contracts, and without the risk of equipment reliability hampering the costly trials process is of extreme value. This is where the Qioptiq group can bring its experience, track record and pedigree to bear. Qioptiq is recognised as “A one stop shop for optical solutions” and this applies strongly to the SMP domain where the group has over 20 years of experience. Positioned all around the world, with operating facilities in seven countries, the Qioptiq group is well placed to deliver assistance to the World’s SMP’s big and small, when it comes to the design, development and support of STA equipment. The KITE family of Image Intensified weapon sights, the VIPIR2 family of uncooled thermal surveillance and weapon sights, the SMMI range and a wide range of other development and pre-production equipment means that Qioptiq can provide off the shelf, combat proven, low risk equipment to assist SMP’s in the area of Night Vision and Sighting Systems. Qioptiq recognise that it’s about more than just the technology. As designers of high tech night vision and thermal imaging equipment, Qioptiq fully understands that the successful design, development and support of a product is about far more than just choosing the latest technology and designing it into a product “just because you can.” With a typical in service lifespan of 10-15 years (or in the case of KITE, over 20 years service with the UK MoD and numerous export customers and held up as the benchmark in the world of Image Intensified weapon sights) the whole through life management of the product needs to be taken into account right from the early design and development phases if the product is to remain effective, provide value for money to the customer and perform when needed for the ultimate end user – often under extreme operating conditions. Keeping equipment operational throughout extended periods of service whilst ensuring performance is maintained can be achieved through phased enhancements. Appropriate technology insertion is a key driver for many of today’s SMPs, particularly now as many off them are entering into acquisition phases and budgets are being established. Qioptiq recognises the need to fully understand and minimise the whole through life cost of the equipment capability as vitally important. For Qioptiq it is a familiar scenario and one that they have been engaged in for a number of years, working in partnership with the UK MoD’s Defence Equipment and Support (DE&S), Dismounted Soldier Systems Integrated Project Team (DSS IPT). In 2005, following an initial pilot support study project, the DSS IPT, decided that it would be more efficient and beneficial if industry were given the responsibility of supporting, through maintenance and repair, its fleet of Dismounted Close Combat (DCC) Night Vision and Thermal Imaging STA equipment on an availability basis. An Invitation to Tender (ITT) was issued to Industry inviting them to bid for the CASE (Contracting for the Availability of STANO Equipment) contract. Qioptiq were competitively down selected and awarded the CASE contract, a rolling five year contract (now in its fourth operational year) that provides support for over ten equipment lines with a total equipment fleet in excess of 20,000 units. With responsibility for ensuring the prime equipment fleet of night vision and thermal imaging equipment is kept operational and available, the contract also requires that demands for user level spares are fulfilled. 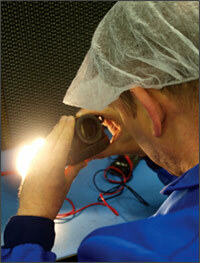 Qioptiq manages a range of equipment lines under the CASE contract, including equipment manufactured by other suppliers. In these cases, third party agreements are put in place allowing Qioptiq to carry out certain repair and maintenance tasks, or if this is not possible, equipment is returned to the Original Equipment Manufacturer (OEM) for repair then returned to Qioptiq for booking into the A1 stock (equipment ready for service) pool. With a number of agreements running this has proved to be a highly successful approach. Having direct responsibility for STA equipment support has provided other benefits, two examples being product improvement and product re-configuration. The VIPIR2 Thermal weapon sight entered service in 2006 and since then the CASE contract has provided the conduit for a number of gain share product improvements to be implemented in “real time” as a result of the Defect Recording and Corrective Action System (DRACAS) in place within the CASE Management Information System (MIS). The CASE environment allowed for the A1 stock to be quickly modified ensuring that future demand was of the latest standard without needing to organise product returns or in-field mod kits. This is a single example of where both customer and supplier can benefit from an overarching support contract like CASE. In a similar thread, the UK MoD had a requirement to re-configure several thousand night vision weapon sights for use on a specific weapon. This required modifications to optical sub assemblies and components all of which was successfully managed within the CASE support contract. The CASE environment is based around a simple and secure straight forward MIS which is provided to authorised customer stakeholders so that they have full access to all activities being carried out on the CASE contract. This greatly assists in the decision making for prioritising and issuing equipment to in field units, as well as keeping a track on the equipment in the repair pool and available as A1 stock for issue. The CASE contract also provides a 24 hour, seven days a week, 52 weeks a year (all holidays included) call out service to ensure that demand targets are met and equipment is provided to the customer on time. CASE has proved to be extremely successful for both the DSS IPT and Qioptiq with performance and availability up and overall support costs reduced compared to the pre CASE support arrangements. It is clear that the partnership arrangement in place between Qioptiq and UK MoD is working well and this is a model that Qioptiq feels could work elsewhere around the world where customers are looking to contract for the support of their STA Equipment on an availability basis.